In this strong scholarship application essay, the writer responds to the prompt with a wide array of key details. Scholarship prompt: The word leadership means different things to different people. What does leadership mean to you? 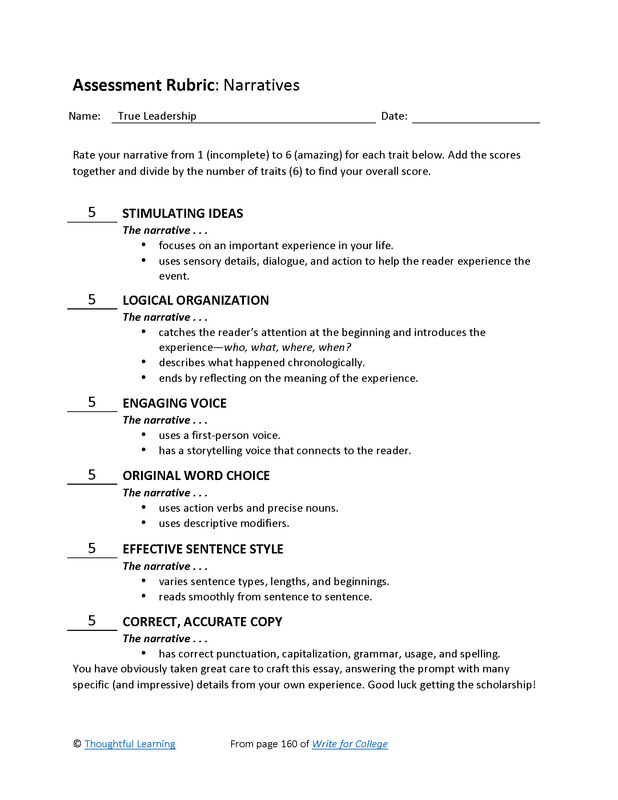 Write an essay giving your definition and providing examples of times that you showed true leadership. Filthy, sweaty, and exhausted, we had just finished cleaning up flood devastation at the Veterans’ Terrace Building after the Great Burlington Flood of 2017. Unfortunately, my only route home lay across a bridge the National Guard had closed. Governor Walker, Representative Vos, and Mayor Hefty had surveyed the damage and started to cross the bridge. I went with them, helping Mayor Hefty onto the sidewalk. This came naturally: we had known each other for my three years in city government. Experiences like this have imprinted on me the need for leaders in times of crisis and have shaped my goals for the future. I am a leader in my school: President of the National Honor Society, Vice-President of Student Government, and Chairman and Founder of the Teacher Appreciation Committee. I founded this committee to address the problem of teacher morale at my school. Through our efforts, including a “Teacher of the Month Award” and “Dress as Your Favorite Teacher Day,” we have made Burlington High School a better place to teach. In addition to these leadership roles. I have served on the Danish Exchange Planning Commission. This group has organized the exchange of students between Burlington, Wisconsin, and Roskilde, Denmark. At our school, I hosted Laura Lund-Knudsen and later represented my school and community when I stayed with her family in Denmark. While in Denmark, I soaked in European culture and customs, and viewed my own country from a new perspective. The next year, I hosted Nikolaj Jensen-Holm in our home for a week. My experience has helped me better understand what it means to be an American and how to participate as a citizen of the world. I have also discovered that one of the best ways to lead is to volunteer. I have donated blood multiple times as well as volunteered at several drives. At Madison, I hope to continue to donate and work with the American Red Cross to help those in need. Because I have benefited from many theater and music experiences, I have given back by volunteering at the CATHE Community Center Fundraiser, at Chocolate Fest, and at Tall Tales Music Festival. Through these and other events, I have helped raise thousands of dollars for these programs, which will allow younger students to discover their passions. In times of crisis, we all need strong leaders. However, leaders aren’t created by crisis; they are created by daily decisions to work hard, to help others, and to know the people they represent. In the next few years, I will continue to do all these things at college, in my community, and for my nation. True Leadership by Thoughtful Learning is licensed under a Creative Commons Attribution-NonCommercial-ShareAlike 4.0 International License. Based on a work at k12.thoughtfullearning.com/assessmentmodels/true-leadership.